The food – a short menu which is always a blessing – is a fish and meat paradise but not much except olives and one main course for vegetarians. After all it is a grill and exactly what you would expect from a Portuguese/English restaurant. We didn’t choose starters but they were a mixture of rock salt sardines, pate, soup and prawns. The mains are steaks, chicken, ribs, and fish – relatively plain, with a couple of specials which on our visit were Chateaubriand (1kilo for 2) and grilled seabass. All the mains came with chips and basmati rice. We chose the specials. 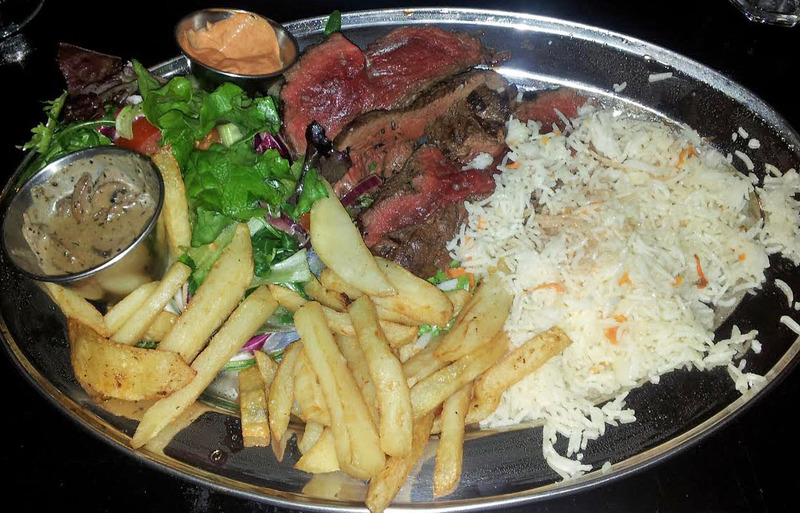 The Chateaubriand came medium rare and was exactly that – very pink. It was huge and I was pleased to share it with someone with a larger appetite than myself. But a real surprise was the basmati rice, which was really fragrant. You have to wait for 15 minutes for the steak but we were hungry and tucked into the rice straight away. As a result the picture shows only half the portion. It came with a couple of sauces – mushroom and something we couldn’t really identify but was pink. They also provided extra sauce and we chose mustard, ketchup and mayonnaise. The fish was pronounced very satisfactory from the third member of our party – he is not renowned for over the top recommendations, so I’d translate as – it was great. For dessert we shared a plate of cheese and one of us had a dime bar cheesecake. No-one wanted to share the cheesecake but it is definitely a size to share, especially after the hefty meat course. They do not go in for meagre portions. We picked the red wine (Casa Antigua) that was recommended by another table and a bottle of beer (Super Bock). The local alternatives for those looking for hefty portions of meat are Joint and Honest Burger but both are fast food, so BVG is the one to linger in. I am glad for the re-visit. 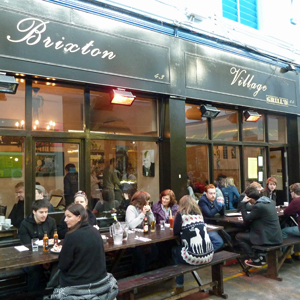 Many restaurants in Brixton Village need to up their game, faced with the new competition, but we think that BVG has done that. It offers simple well cooked food that they can turn out quickly to a good standard and a relaxed atmosphere where you can talk without shouting but still feel a buzz. The price per person is around £24 for two courses – our bill for three including the drinks was around £70.00.